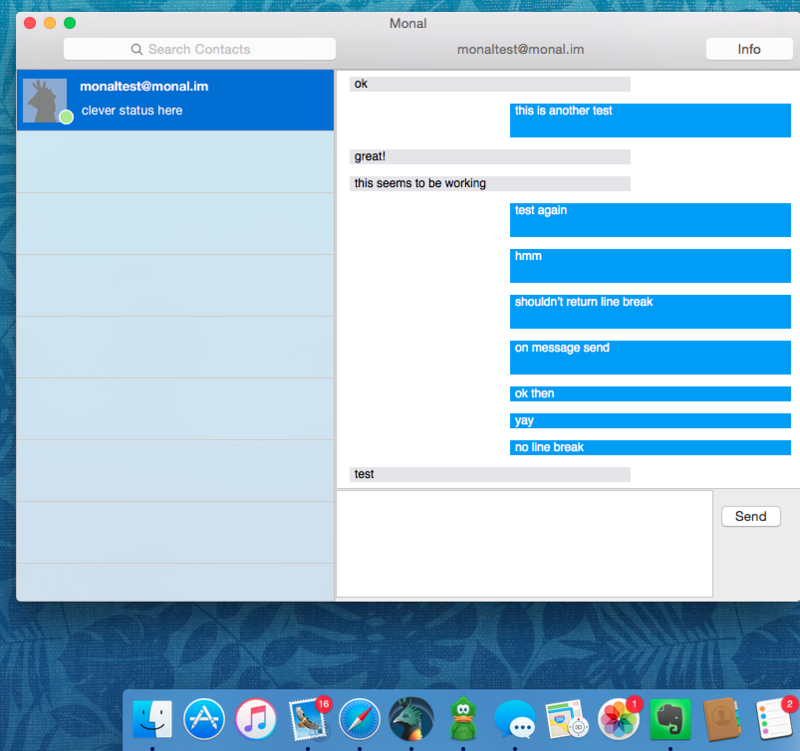 Back in February, I toyed around with compiling Monal for OS X. It was an interesting experiment. It did get me thinking about how well I have or haven’t made my app and whether I could release a Mac app with a proper native UI. Today I got a minimally viable OS X client to work — some thing I started long ago and then dropped. Monal 2.7 onwards will be on the Mac too. Today, I personally have switched from Adium to Monal. My first new IM client since 2004. As you can see below, I decided to go with the iMessage route rather than Adium as I felt it was more modern. Since this is a modern XMPP client, this will also be the first OS X client to support Carbons and stream resumption. It also has some UI features that I missed in Adium like replying from notification bubbles. I am also planning on adding Handoff with the iOS client, because why not? I plan on making this a free app in the Mac app store when it is ready. After I complete the addition of a few more features, I will probably put a zip file up for people to try out. Hi, please consider releasing your applications under a free license, this would greatly benefit the users and even yourself. Hi, I totally support this suggestion, we really need more free software, software that let us help with the project getting more freedom and privacy in return (just like what happened with Conversations on Android) or any GNU/Linux distribution. I don’t disagree. I’m ordinarily an open source developer and have contributed to projects on Linux and OS X for over 15 years. I’m cautious about open source on iOS due to the Drm in the App Store and the need to staticly link — this is also why there is no otr, as libotr is GPL. There have been a few major incidents where people have exploited open source license terms to take down App Store apps (Vlc) with copyright complaints that is making me very cautious.